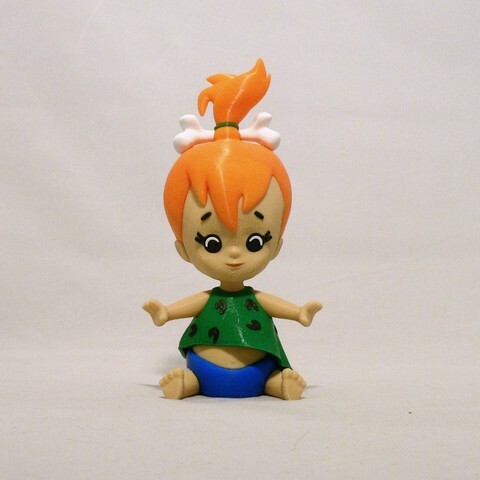 Pebbles, from the Flintstones cartoon show by Hanna-Barbera. 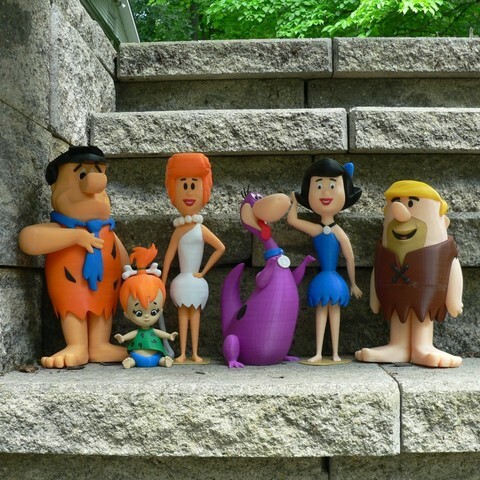 The Flintstones cartoon takes place in a romanticized Stone Age setting, depicting the lives of the Flintstone family and their best friends and neighbors the Rubbles. 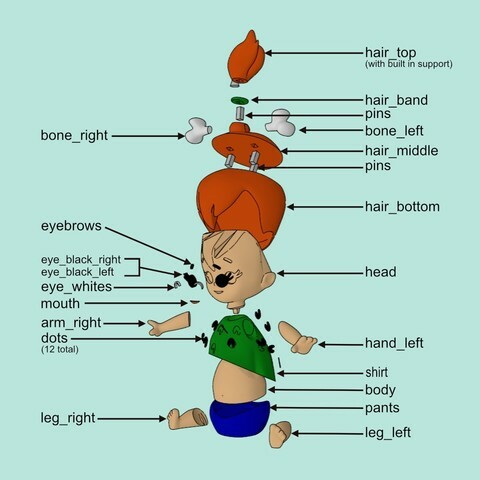 Pebbles was modeled in proportion to my Fred, Wilma, Barney, Betty and Dino models. No supports are required. If you have the proper filament colors, no painting is needed. The model is 155mm tall after assembly. 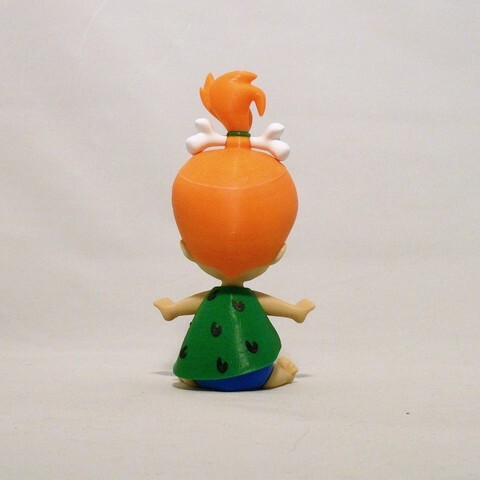 Enjoy, and I hope you have a "Yaba Daba Do" time printing this! 1-As with most of my models, no supports are required. 2-Be sure to clean any first layer squish if you have any problem joining parts. The parts should fit nicely when printed cleanly. 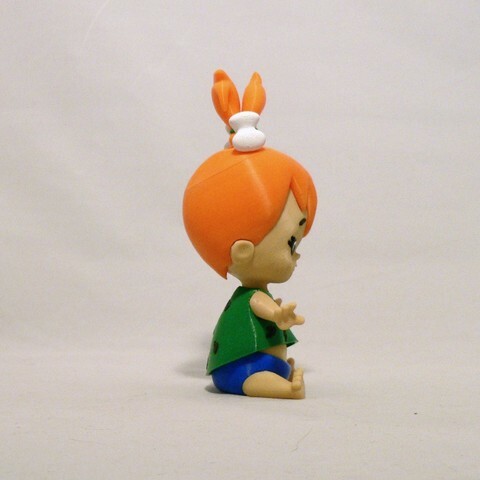 3-The hair_top piece contains a built in support structure. Just print without supports and remove the built in support structure. 4-The only printing issue I had was with the mouth. It is very small and for the first time in three years I actually used a raft to print it. Everyone's experience with small parts is different. 5-Use your discretion for rafts/brims on the bone, arms and hair_top since they are all top heavy pieces with smallish bases. 6-Most importantly to me, my wife says Pebbles looks very cute! 1-The left and right eye_whites are interchangeable. For ease of assembly, I suggest inserting them into the eye_blacks with the smooth side facing out but either way works. 2-The left and right eyebrows are interchangeable. 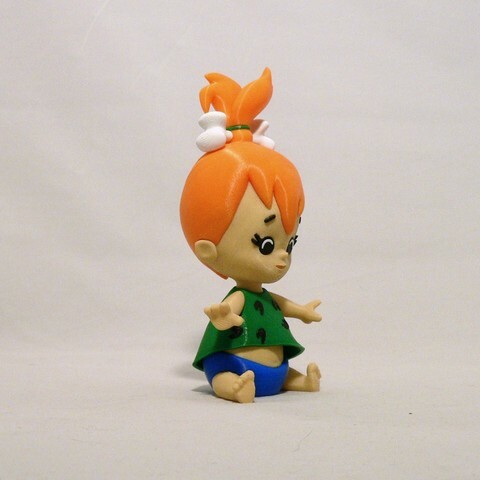 3-Since Pebbles is a smaller model, I did not have too much leeway in making connectors for all parts. The bones fit into the slight indents in the hair_middle piece and the larger portion of the bone simply rests on the hair. Look carefully at the bone, it could accidentally be positioned upside down. 4- The hair_top could be accidentally inserted backwards, please refer to my photos such that viewing from the front the hair sweeps up and the back sweeps down. 5-Refer to the assembly diagram for putting the model together. The model is meant to be glued. Retired software engineer, learning CAD design and 3D printing. When creating models, I strive for support free designs and fun creations.